They have many different models to choose from for any situation. And they’re packed with features. Models range from 300 cranking amps all the way down to a 2 amp trickle charge rate. Cases and housing is made of durable steel construction that will hold up to the typical type of abuse that you would expect out of a busy auto shop. They have a non-conductive bar built into the handle which is a convenient place to clip your battery terminal clamps onto when you’re rolling it around. Wide track wheels and extra long AC cord for better reach. Extra heavy duty clamps with thick gauge, extra flexible welding cable give you the power and reliability you need. There are manual and automatic models. They have a generous three year warranty. When we call a product “The Best In The Industry”, we don’t throw these kind of words around lightly. Christie Battery Chargers really are the best in the industry. Why? How ’bout the heavy gauge steel case. And then there’s the fact that they’re UL listed as suitable for all weather outdoor use. How many other battery chargers can claim that? They have automatic reverse polarity protection. They’ve been around since 1929. These are true professional chargers. They have over 200 service centers nationwide. The awesome 5/2/1 warranty is hard to beat. And some models have a 10/5/1 warranty. How can they do that? Plus, let’s not forget, they’re made in the USA. 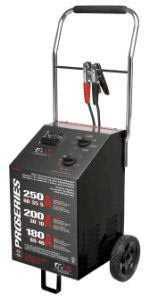 How many battery chargers are made in the USA these days? Do the research. You’ll have to search long and hard. They have models to meet almost any shop owner’s needs. Models that are microprocessor controlled, automatic charging with overload protection. There are models that are true battery service centers and have features like load testers and fast, medium and slow charging rates. They even have a battery charger deep discharge recovery model that has a desulfation mode. Enough is enough. You simply must check them out. Give us a call at 800-229-6218 as soon as possible.